WASHINGTON — A sinkhole on George Washington Parkway has closed part of the northbound lanes for days while repairs continue. 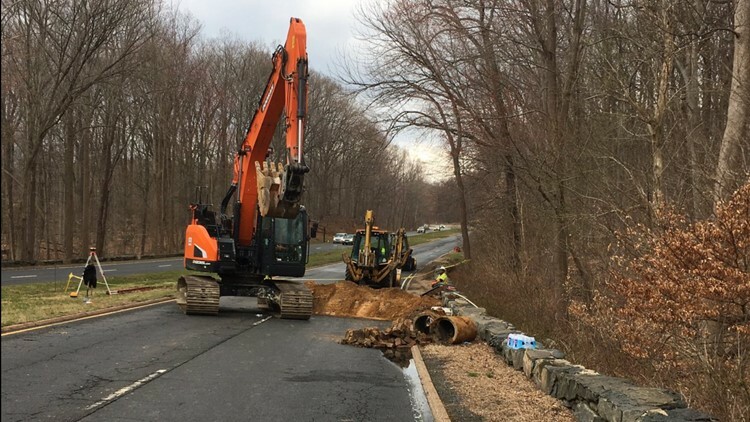 The National Park Service, which manages the parkway, said engineers determined excessive amounts of rain water inundated and broke a 60-year-old storm water pipe 10 ft. underground. Officials said this is unrelated to the road surface or condition of the parkway. Repairs to replace the old pipe with a new one began midday Friday and are expected to continue through the weekend. "Drivers should prepare for the Parkway to be closed through the entire weekend, but we're hoping to open it as soon as possible," Aaron LaRocca, the chief of staff for the George Washington Parkway said Friday afternoon. LaRocca said the sinkhole was not as a result of potholes in the road. "This is something much bigger than a pothole, it goes to the sub-surface of the roadway," he said. "This is having to do with the drainage of the roadway. Water caused this issue." The sinkhole opened up overnight and road crews responded. As a precaution, both northbound and southbound lanes were closed Friday morning. Drivers experienced an influx of traffic due to the sinkhole. "They're a little backed up," one driver said. Multiple other drivers expressed they were running late as well. Later Friday morning, the southbound lanes were reopened, but the northbound lanes remained closed. The sinkhole is north of McLean. The Parkway ends at the Beltway, I-495, but but traffic is now being directed to VA-123 which also hits the Beltway. "I'm just coming back from West Virginia and usually we come down the Parkway but we had to take a detour around it," another driver said. The GW Parkway closed Thursday night and again Friday morning after potholes opened up on the road causing serious damage. Engineers with the Federal Highway Administration have determined the sinkhole does not pose immediate risk to southbound lanes. The National Park Service said the northbound closure between the Beltway and Route VA-123/Chain Bridge Road will probably last until Sunday.